Vokle, a web-based video communication platform, announced today that it has closed a $767K round of seed funding. The round was led by Tech Coast Angels, Sierra Angels, Grammy-nominated singer Imogen Heap, Rafe Furst, and various private investors. The round was the second part of a $200K angel investment the startup closed at the end of last year (led by the same investors), and adds to the $300K of seed capital it raised back in 2008, bringing Vokle’s total funding to $1.26 million. The startup will be using its most recent funding to continue building and scaling its user base, to step up hiring efforts, and to finish its move into new, larger office space in downtown Santa Monica, CA. Vokle is a live, web-based video talk show platform that enables you to interact with your audience in realtime. And if that doesn’t get you, the cool thing about Vokle is that it’s a microsite, or an app if you prefer, so you can embed it anywhere, like a YouTube video. Obviously, Vokle isn’t a destination site, so you can add it to your website to give your visitors a one-stop experience, rather than redirecting to Vokle’s homepage, which gives a little boost to those user-retention/bounce stats. Vokle’s platform also allows users to broadcast their live video and audio to a virtual auditorium of viewers, while taking live video calls and text-ed questions from the audience. So, users see the video window on their browser, plus a feedback and chat area, but the broadcaster is party to a backend that enables a number of different curation and editing tools. It aggregates questions from audience members, can assign remote co-hosts, provide screenings to approve video callers behind the scenes, or work with an editor to cut between single or multi-shots in realtime. 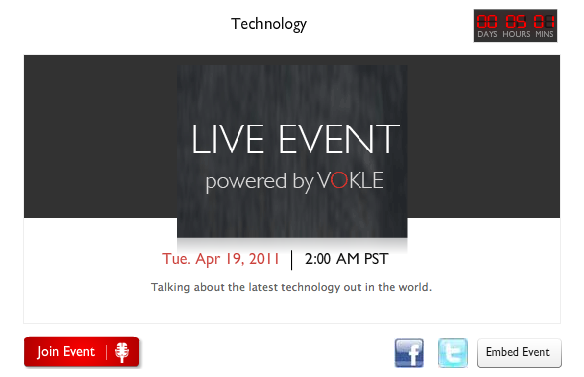 Unlike Justin.tv, which is really one-way broadcasting, Vokle is going for town hall-style, social video broadcasts. It wants to enable every person in the room to ask live questions and contribute to the conversation in everything from fan clubs and virtual meetups to jam sessions and charity events. Imogen Heap, for example, held live auditions for a cello player before a recent tour, and Arianna Huffington used it to interview Carl Honore. Check it out to see Vokle in action.